JOIN VFP VETERANS, ACTIVISTS & STUDENTS at FACETS MULTIMEDIA, on January 22, for a free screening and teach-in on the film Winter Soldier – with University of Chicago historian Mark Bradley. In February, 1971, one month after the revelation of the My Lai massacre, VVAW – Vietnam Veterans Against the War – organized a conference in a Detroit motel where 125 vets from the war in Vietnam came together to heal a nation and themselves. Risking everything – careers, friendships and family – they talked about the atrocities they had committed serving in Vietnam. 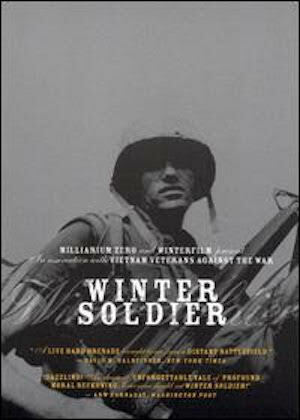 They saw themselves as “winter soldiers”, battling the wrongs of the war and the brutal training that had made them capable of unthinkable violence. 18 filmmakers organized the Winterfilm Collective and captured this extraordinary event on film. It’s been called one of the most powerful anti-war films ever made and remains, yet to this day, a remarkable plea for peace. The speaker, Mark Philip Bradley, Bernadotte E. Schmitt Distinguished Service Professor of International History from the University of Chicago, has written 3 distinguished books on Vietnam: The World Reimagined: Americans and Human Rights in the Twentieth Century, Vietnam at War, and Imagining Vietnam and America: The Making of Postcolonial Vietnam. Mark will introduce and discuss the film with the audience.